We have had more losses here at the ranch. Our Livestock Guardian Dog pack was older and being giant breeds their lifespan isn’t as long as the border collies. Still these dogs have guarded our goats, sheep, llamas, chickens, rabbits and cats against all sorts of predators. Our Larick has been a working LGD since his first breath. This boy only stepped paw into our cabin in Colorado ONE time in the entire 7 years we were there and for only a few minutes before he ran in terror back out the door. Larick was NOT a house dog. He was a guard. He has guarded against bears, mountain lions, badgers, hawks, eagles, owls and other assorted birds of prey. He has been bitten by a rattle snake and lived to tell the tale. 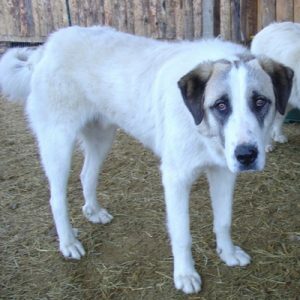 He and his brother Rowan, were the two LGD that had been bitten by rattle snakes. Rowan was bit in the front leg, but poor Larick was bitten in the face. His entire head swelled up and I was worried we would lose him. But I covered him with essential oils which helped dissipate the venom and bring the swelling down so that he could recover and not suffocate with all the facial swelling. The vets in mountains of Colorado also told us that a dog bitten in the face was surprised by the snake, but a dog bitten in the leg was in a fight and more than likely killed the snake. Larick was the one taken by surprise and his brother Rowan finished the job. That is how those boys were. They were a team that worked well together. We got both the boys when they were 5 months old and Larick was with me for 10.5 years. That is a long life for a working Anatolian. Back here in Michigan, Larick’s life was a little more tame. Granted he had to deal with all those people driving up and down his road, jogging people on his road…like what is that all about, he so didn’t get jogging, and that blasted postie person that violates our mail box almost every day no matter how much he told them to go away!! We have a lot of coyotes here, several packs that surround us. And they have stayed away for most of the time that we have been here in MI. Recently with the loss of four of our LGD, the coyotes are starting to come up much closer and even coming onto our land and up on the backside of the pens. Larick would be horrified at this and up singing you the song of his people all night to make those nasty coyotes leave. 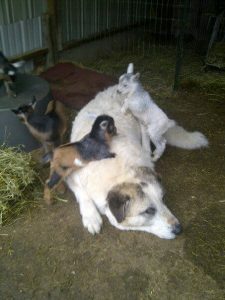 He was such a gentle soul and let the baby goats stand on him, jump and run off him, and just generally use him as a spring board play ground. He never growled at them when they ran all over his body no matter how much pain he was in. They were his goats and he loved them. Both Larick and us all thought he would go out in a blaze of glory defending his goats. Little did we know when we got 3 new Anatolian dogs to train for his replacements that one was going to be his end. He was attacked by one of the new Anatolian dogs, Toobies. Toobies almost killed Larick and only because Charlie heard one of the other new dogs (Rachel) throwing a fit, did he run to see what had happened. Charlie came upon a horrible scene and it took numerous buckets of water thrown repeatedly at the offending younger dog to get him to release Larick’s throat. We had to rush Larick to the vet after hours for emergency surgery and even after all that and convalescing in the house for two months, we had to make the decision to let Larick go. It absolutely broke my heart but I am glad that I had those two months with him in the house and that he had two months inside off duty on the sheep skin rug getting little tidbits of deli meat each day with his pain meds. He transitioned into the house markedly well for an old giant male dog that had no interest in houses in his entire previous life. I will miss you my baby, with your calm confidence, steadiness and my complete faith in your protection. But most of all I will miss all those quiet moments in the goat pen when you quietly came and laid your huge heavy head in my lap and just sighed. We only had Ceiba for a short time of about 16 months. She came to us at a year old and was our hopes for a new Akbash female to both guard and to breed. She was not happy the moment she got here and no matter what we did to try to work with her she would have none of it. We tried having her in the house to get used to us and to be out with the goats and guard. We spade her to try to calm her and gave up any thoughts of breeding her. She was so terrified of people in general and me in particular. Even after 16 months working with her, she still saw me as a predator and stranger. When she was in the house she would not bark or growl at me. She would never come to me. She never bit me. Never did in the entire 16 months we had her. She wasn’t aggressive even though her bark sounded fierce. She was just terrified of everything in the world around her. When she was outside, she would bark and growl at me sometimes for 8+ hours per day. I couldn’t leave the house to even work in my vegetable garden as she threw a fit. We tried essential oils, Bach Flower Remedies and even medications to calm her and let her be at ease. But there was nothing that we could do. She barked at every vehicle, person, or biker that went by on the road. She barked at every one of us here at the ranch and ran from us. We were not even sure if she guarded the goats as the only time we saw her, she knew we were there so she changed her behavior. I was totally bonded to her but she was not to us and I had never seen a dog that was so singularly unhappy at her very core as she was. Shortly before we let her go, we did see something phenomenal as in that she had never shown this behavior before. The new Anatolian that had attacked Larick was let into the pasture where Charlie, myself and two other people familiar with LGD and the breed were standing. We wanted to evaluate both that new Dog, Toobies, and also a few of the others. Toobies tore through the pasture almost running down goats and humans alike in his high energy and disregard fro everyone around him. We had no warning this was going to happen but out of the corner of our eye, we saw a white flash. Ceiba make a straight high speed bee line for him from the other end of the pasture, and hit him at a full run body checking him and almost knocking him down. She has decided his behavior was dangerous just as we were deciding it was as well. Obviously she was way faster than we were. But that was the only time, in the entire time we had her that she seemed to have any confidence and act in a behavior that would seem appropriate for an Akbash LGD. Finally at the advice of her breeder and the vet, we let her go. It was one of the hardest things I have ever done and since it was also the same day that we let Larick go, there were tears plenty all around. Finally she was at peace. Because being here she had no peace inside her head no matter her outside environment or circumstances. 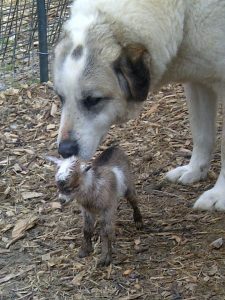 This is the hard part of Livestock Guardian dogs. They are bred to be independent thinkers and to be able to make their own decisions. Unfortunately sometimes they chose to be unhappy and there is just no fixing that. 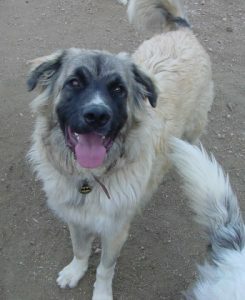 Broch was a Great Pyrnese that I got from a shelter in Trinidad, Colorado. The shelter estimated he was about 10 months old when we got him and he was with us for 8.5 years. So by our estimate, Broch was 9.5 years old when we let him go. He had problems with his hips from the day that we got him. They didn’t seem to be very strong or set correctly in his hip sockets. We knew that this would ultimately be the reason that we let him go and it was. Brock was mentally still all well and very much with us but his pain had gotten to the point that it was unbearable any longer. No pain medications would really help him because he didn’t have any cartilage at all. By this more advanced age, he wasn’t putting much weight on his back legs at all. His front knees and shoulders though were starting to have issues as well. This higher level of pain was increasing his grumpiness that had always been there to an extent. It was making life for him, all the rest of the dogs and all the humans here unbearable as his pain levels were too much. Dogs express pain differently than humans do. He didn’t limp like Rowan did so it wasn’t as obvious how much pain he was in. Since he had lived with his pain his entire life, he hid it well. But with his increasing bad temper and flare ups it was more obvious he couldn’t manage his pain any longer. That was when it was time for us to let him go. Broch had guarded outside when we were in Colorado, but once we moved to Michigan, he was officially retired to the house. He guarded me and the house. He was so loving and sweet to people and one of his absolute favorite visitors was Mable. When Mable came to visit, Broch’s eyes would light up. He loved biscotti and Walker Shortbread and would almost climb into the chair with Mable if she had any treats. Broch also was one of the softest furred dogs. His hair on his head was silky soft and just wonderful for spinning. I have had many folks get some of Broch’s fur for spining dog hair classes. I miss you boy, but I am glad that you are free of pain finally. Although Toobies was only with us for the summer, he did make an imprint on our lives. I thought I should include him because it didn’t feel right to not. He was a beautiful dog physically and personality wise was very interested in people. He didn’t seem to have a lot of interest in guarding the goats. He was much more into people. I don’t think he would have made a good LGD from what behavior we saw with him. He not only attacked Larick and tried to kill him, but he would walk off and escape the pens and leave his stock. 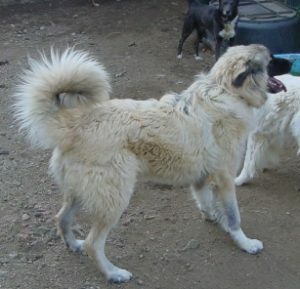 A good LGD that was bonded to his stock, will NOT leave his stock to go on a walk about. Toobies wasn’t chasing predators, he was just on a walk about. 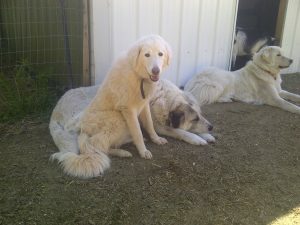 And a good LGD works with his partners to guard against and attack predators, not to attack the other dogs in the pack. Sometimes you will encounter a dog that is a LGD breed, but isn’t an LGD. Not every single dog that is a LGD breed will be a good LGD. It requires a certain confidence and strength, as well as a desire to guard the stock and be with them. He didn’t the necessary confidence to make good LGD decisions, and he didn’t seem to have the desire to protect and stay with the stock. We didn’t dare bring him into the house and use him as a house guard with people or to re home because we didn’t feel he could be trusted after the way he tried to kill Larick. We didn’t feel that our border collies would be safe. so we had to make the very hard decision to let him go. Being the right decision, did not make it any easier. I am sorry but you can rest now. What we couldn’t know until after the decision was made was how it would affect the rest of the pack. What we saw was absolutely amazing and removed any doubts that the decision to put Toobies down was the BEST decision possible. His brother and sister were also here. And his brother Ike, was showing some aggressive behavior that had us worried. We thought it was triggered by Toobies but were unsure. I can not believe the change in Ike since Toobies has been gone. It has only been a month since we let Toobies go, but his brother Ike is a completely different dog. He is steady, calm, only shows strength or aggression at predators when he should, and he is settling down and starting to finish nicely. I never thought I would say it, but he may very well be my new Larick. He has that serious focus for guarding that Larick had although being a young dog is a lot louder than Larick was in his later age. I do recall though how loud Larick was when he was younger, so I know that Ike will calm and settle down. I am developing great confidence in him and feel that my goats are much safer with him around as am I. All around the month of October was a particularly difficult month for both Charlie and I. It will take some time to heal and it is much quieter here on the ranch. So much loss in such a short time. There are hard and difficult sides to LGD and ranch life. This is one of them that no one ever talks about.